This Jamaican reissue of an early Lord Creator track, was from a C. Chin track on Randy's, under Lord Crator's real name Kentrick, or sometimes Kendrick, Patrick. Dalkie, in his Studio One discography, also gives it as a Rolando & Powie 7" from the same year. Patrick was born c.1940, in Trinidad, where he started life as a calypso singer under the assumed name Lord Creator. He moved to the island of Jamaica in the mid 1950s, hitting Kingston at a time when the burgeoning music industry was eager for new talent, Kentrick not only sang calypso but also fronted Fitz Vaughan Bryan's big band as a crooner. With who he cut a big Jamaican hit, the incredibly poignant 'sufferers' track Evening News, which was also issued in Great Britain on the Melodisc label in 1959. Kentrick was also well suited to the new R&B influenced sound that was sweeping through the Island at the time. 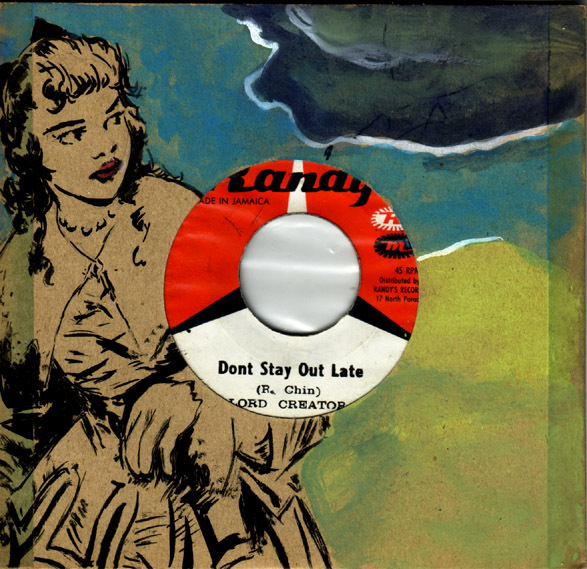 Don't Stay Out Late was a massive hit in Jamaica and put Lord Creator at the top of the male vocalists popularity stakes at the time, a position reflected in his being picked to sing the Island's official independence song in 1962.